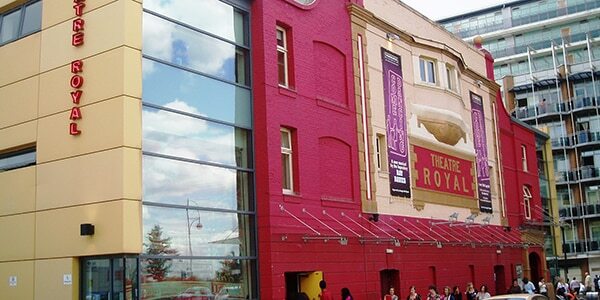 The Theatre Royal Stratford East was built on the site of a wheelwright’s shop and opened on 17th December 1884. Over the next few decades, the theatre underwent several renovations and extensions alongside the presentation of successful productions. The theatre opened irregularly after 1926 due to financial difficulties. Joan Littlewood became the first Artistic Director of the theatre in 1953. It was Littlewood’s productions of A Taste of Honey and Oh! What a Lovely War that made the Theatre Royal famous. She remained in the position until 1979, when she moved to France following the death of Gerry Raffles (the theatre’s manager) in 1975. The theatre was under threat in the 1970’s due to the construction of the Stratford shopping centre, but a public campaign saved the building and it was awards a Grade II listing in 1972. The theatre was further refurbished in 1984 and 2001. History was made in 2005, when the theatre had the first ever British Black musical to transfer to the West End, and in 2012, the space was the hospitality house for the Nigeria Olympic Team. The 460–seat theatre hosts theatrical, new writing, and musical performances, as well as educational workshops, young people’s mentor schemes, open mic nights, and the MonologueSlam competition. The theatre also accepts unsolicited scripts.